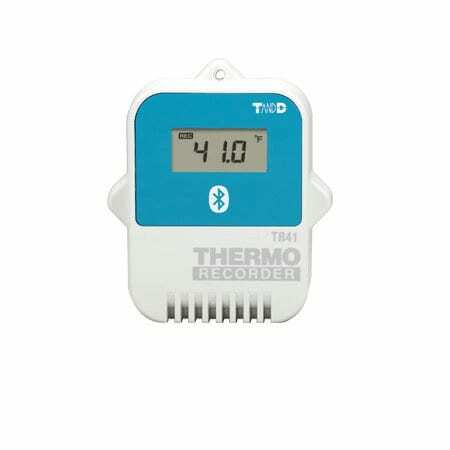 The TR41 Bluetooth Temperature Data Logger is equipped with Bluetooth low energy for data collection with your Android or iOS device. The TR41 features an internal temperature sensor, the TR42 has an external -60°C to +155°C probe and the TR45 features a Thermocouple / RTD interface. All models feature an LCD display, long 1.5 year battery life and the ability to store 16,000 readings. Real-time monitoring of changing data and uploading recorded data is done via the free cloud service “T&D WebStorage Service”. The “ThermoREC” App makes it easy to automatically get real time data as it changes as well as view data in graphs and make all device settings directly from your smartphone. Temperature Data Sent to Your Mobile Device via Bluetooth!